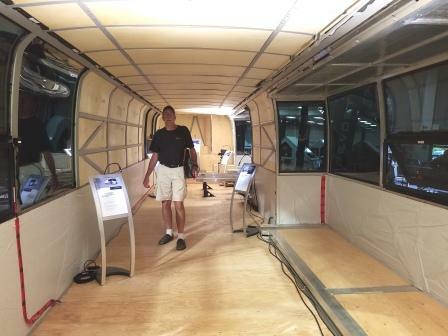 The biggest RV show that Storm and I have attended in the past was the one in Raleigh last year. 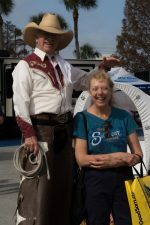 According to our many new RV friends, we just had to attend the Tampa RV show and see a Super show. Since it is only 2.5 hours from our campsite in Bunnell, we head down there this weekend to visit again with Matt and Sherry who were volunteering there and see the show. It was HUGE, no doubt about that. We see lots of tempting improvements that could be made to our RV if time and dollars allowed, but for the most part we confirm that for the money we spent on it we probably did alright with the coach we purchased. 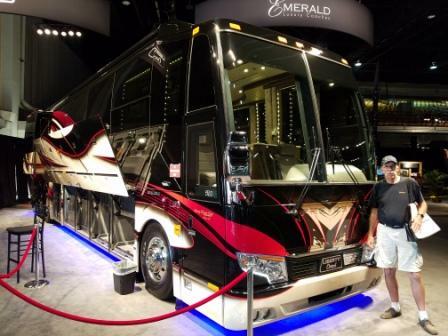 Storm is very tempted to buy a new Prevost (he especially loves the paint jobs on them) though none were open for hoi polloi like us to tour. Here is a picture of a coach that Storm would be happy to have as a new ride. At least I think that is true since even the price of these models was a closely held secret at the show. But this bare bones version is the most of that type of coach that we can afford if we scrape all of our money together and borrow a little more.